Short hair looks excellent with a beard because it gives a really manly look. The amount of styling that you will need to do will depend upon the image that you are trying to portray. You can get a short hairstyle with a beard that can be professional and groomed or rugged and outdoorsy. We have collected a list of the most handsome beard styles for men with short hair. Beards have seen a resurgence in recent years as part of the hipster fashion trend. This look often includes a short hairstyle with a beard that is big and bushy. The beard will be eye-catching but groomed. If you don’t have short hair preference, check these hairstyles with beard ideas. Here are 80 short hair and beard style combinations for your inspiration. For a groomed men’s haircut with a beard, you need to make sure that there is not a hair out of place. Trim your beard every day to keep things looking perfect. A short hairstyle and a thick beard can work together to form a “square” or box style. Keep the cut straight at the sides and make strong angles in the style. Use a comb to leave your haircut tangle free. Groom the hairstyle so that it flops lightly over to one side. A thick beard creates a real hipster look. Keep the hair in the center of your head to a long length. Shave high up the sides and back of your head to create a strong contrast. A thick dark beard enhances the contrast even further! You can try a different type of mustache too. Use hair gel to keep your hair in perfect stylised peaks. Trim your beard so that it is short and thin. Add more shape and definition to your beard with thicker areas around the chinstrap. Comb your hair back into a flattened down hairstyle. Use a little hair gel to keep your style in place. Avoid using too much gel or else you will slick your hair back too much. Give short hair a choppy cut to help to create the illusion of more volume. Run your fingers through your hair to create a lightly fluffy effect. Use a comb to lightly sweep your hair over to one side. Keep the sides and the back short. 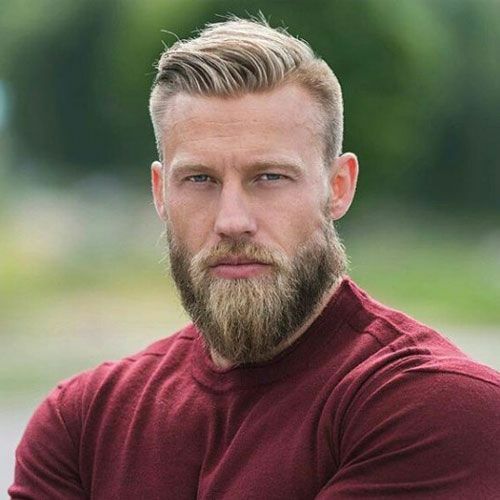 This short hairstyle looks amazing with a beard. You can get an idea from these beard designs. Slick back the long hair on the top of your head and use a comb to make sure that there isn’t a hair out of place. A short fade at the sides of your style will create an impressive contrast, especially if you have a thick beard. For a dapper style, team lightly waved hair up with a groomed beard style. Complete the look with a fantastically shaped handlebar mustache. Now you have seen a cool selection of the best short hairstyles with beards. There are plenty more beard styles and short hair combinations you can try. Take a look to find inspiration for your next style.